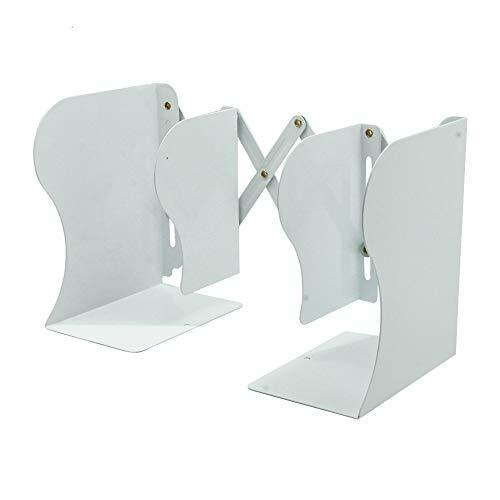 Gorse White Decorative Bookends Heavy Duty Adjustable Books Holder Stand Desk Nonskid Bookend Metal (White x) by Gorse at Home Decor Outlet Store. Hurry! Limited time offer. Offer valid only while supplies last. Welcome to our online shop, to choose and buy your favorite bookends!The accordion design at the back of the bookrack makes it fully adjustable. Welcome to our online shop, to choose and buy your favorite bookends! The accordion design at the back of the bookrack makes it fully adjustable. Extend the bookends to their full 15-inch width. Retract the bookrack to as small as 6-inch across. The clever design of the bookends keeps everything secure and it's solid enough to hold oversized and heavy books without anything falling over. Size: 20*7.5*6.3 inches. Metal material, sturdy and durable. Fine craft, delicate and fashionable. Extended angle design can make the bookends stretched, then more stable. KEEPS BOOKS ORGANIZED - The unique design of these bookends securely holds your reading materials - books, manuals, directories, catalogs, magazines, files, and more. The bookends of free expansion can take up your minimum space, but can be best used. Three pieces of received space, convenient and safe. The longest adjustable distance can be up to 50 centimeters. Office Square Adjustable Metal Bookends are a welcome gift for anyone who loves to read. If you have any questions regarding them or any other bookends we sell, please contact us. Click on the buy button now to get your bookends! The extension book rack can be applied to any place -- home, school classroom/library, office and so on, as long as you need it. If you have any questions about this product by Gorse, contact us by completing and submitting the form below. If you are looking for a specif part number, please include it with your message.